It's difficult for me to blog about anything other than what's immediately on my mind, and in this case, it's a new book about Bion (1897-1979; pronounced BEE-on) that a government agent deposited into my greedy hands just yesterday, A Beam of Intense Darkness, by the eminent psychoanalyst James Grotstein (see also here for a more complete description). It's partly an attempt to present Bion's revolutionary ideas to a wider audience, but in eagerly reading the first few chapters, I'm not sure if that is even possible, or if Grotstein is the man to do it. Grotstein's intellect hovers so far above the average person's, that I don't know if it even reaches that low. In any event, I'll probably be discussing this book in the next few weeks, just as I spent several weeks playfully calmposting The Symmetry of God. I've written before of how encountering Bion's work in 1985 is what first exploded -- or O-bliterated -- my mind. Interestingly, that was in only the second year of my Ph.D. program. As Grotstein points out, people either "get" Bion or they don't. Most -- including most trained psychoanalysts -- don't, but a few do. And those who do tend to become disciples, even over-idealizing the man as a sort of mystic messiah. Bion was aware of this latter tendency of people to see him this way, and it apparently made him very uncomfortable. One reason he said that he left England for America in the late 1960s is that "he was so loaded down with honors that he nearly sank without a trace." Bion's work is highly specialized and aimed at a narrow audience of psychoanalysts, and yet, I was one of those people who completely got it. (By the way, I do not recommend straight Bion to a lay audience, any more than I would recommend trying to read Finnegans Wake; in both cases, you definitely want to begin with the secondary literature.) Perhaps I shouldn't say "completely," because no one can completely get Bion due to the very nature of his writing, which is quite skeletal and suggestive, almost like sutras, which consist of a few words that the "awakened" person must fill out based upon experience. Grotstein surmises that Bion "dreamed his utterances and his writings -- that is, he spoke and wrote in a transformational state of reverie (wakeful sleep)," something with which I can certainly relight. Further, he "leaves you orphaned outside his text for you to seek your own way by your own inherent navigational compass -- one you never believed you possessed until you met him." And in his later works, he tried to develop "a more evocative form of writing" with which "to convey his experiences to the reader directly -- as the experience itself -- an authentic replication of the latter without going through obfuscating explanations." The only way to understand his books is to become the author of your own book "more or less based on Bion's." I think I used this metaphor in my book, that this kind of writing is analogous to the reflector lights on the back of a car, which emit no light of their own, but become quite bright if light is shined in their direction. Bion's writing is always indicative, but of an unKnown part of yourself that presently exists in your own future. In short, in order understand Bion, you must bring your own light, and plenty of it, to the inner table (which is also precisely true of religious texts). In fact, Grotstein quotes one writer who suggested that those who do not comprehend Bion fall into certain categories, including lack of truly attentive reading, lack of analytic experience, lack of experience in life itself, or a combination of all three. In my case, I obviously had no psychoanalytic experience, but I suppose that's not completely correct, since I was in psychoanalytic therapy at the time, but still, not enough to remotely qualify me as One Who Knows much about what lay beyond the interior horizon. Nevertheless, his ideas spoke to me in such a manner as to tie up, or bring together, countless unresolved ideas, pre-ideas, and ideas for ideas that were otherwise running wild in my head. By that time I had read a fair amount of philosophy during the previous seven years or so, and was pretty well familiar with all the main schools. But as I read Bion, something in me told me that he had surpassed all of these, which is something I couldn't have "known" at the time, and which few people would claim. For example, I'm guessing that Bion is completely unknown in professional philosophy absircles, so that no one from that world would claim that he was one of the greatest philosophers who ever lived. And when I say "something told me," I mean something quite palpably and physically present. It was as if his words were depth charges dropped into my psyche and exploding various connections so that new ones could be forged. This is a lesson I never forgot, and I definitely aspire to that kind of writing. But who reads in the requisite manner, especially blogs? Thankfully, I am aware that many Raccoons do. It's what makes you bloody Raccoon, now isn't it? I "dreamed" their works, disassembled them into kaleidoscopic bits, and reassembled them anew as they spontaneously came into my mind. In short, I have "cannibalized," not "plagiarized," the works of my colleagues and have transformed them as they made sense to me anew. My gratitude to you for allowing Me to become reunited with me -- and for encouraging me to play with your ideas as well as my own. In my case, I might say "thank you for allowing others to play with your ideas as reflected through me, and thereby reyounighting themselves with their own dark deus." "When conducting an analysis, one must cast a beam of intense darkness so that something which has hitherto been obscured by the glare of illumination can glitter all the more in darkness." I suppose it's somewhat analogous to the way you have to look at distant stars in order to see them. If you look directly at them, they disappear. But if you look away, out of the corner of your eye, they magically emerge from the darkness. In coming days, I hope to shed some additional obscurity on the subject of Bion, but I am once again promising myself that I won't blog on weekends, so that I can attend to some even more distant obscurities in my spiritual galaxy. Obviously it is difficult to wrap our conscious minds around the idea that ultimate reality is infinite, beyond duality, undetermined by any limiting factor, everywhere and nowhere, the deepest within and the furthest beyond; for Him the eye does not see, nor the tongue express, nor the mind grasp. Him we neither know nor are able to teach. Different is he from the known, and different is he from the unknown. So we have heard from the wise, and from Petey. But at the same time, it is said that we are mirrorcles of the abbasolute, and that our souls are proportioned to the Divine Nature. How can our souls be proportioned to something beyond proportion? In the words of the Isha Upanishad, ultimate reality is One: Unmoving, it moves swifter than thought. The senses do not overtake it, because it always goes before. Remaining still, it outstrips all that run.... Bright is he, bodiless, without scar or imperfection, without bone, without flesh, pure, untouched by evil. And yet, deep within us, there is an innersection where it is supposedly possible to "know" this One: The Seer, the Thinker, the One who is above all, the Self-Existent -- he it is that has established perfect order among objects and beings from beginningless time. It's just that The face of truth is hidden by thy golden orb, O Sun. That do thou remove, in order that I who am devoted to truth may behold its glory. "This is the double or synthetic ideal of the Isha Upanishad: to embrace simultaneously Vidya and Avidya, the One and the Many; to exist in the world, but change the terms of the Death into the terms of Immortality; to have the freedom and peace of the Non-Birth simultaneously with the activity of the Birth" (Aurobindo). "The body does not possess being.... Nor is the human heart any more constant.... The human spirit itself, although endowed with reason, changes; it does not possess being.... No one has in himself unity of being.... Let us return humbly to that One Being. Let us enter that city whose inhabitants share in Being itself." Wait, that wasn't Sri Aurobindo. That was Sri Augustine. "Every concept formed by the intellect in an attempt to comprehend and circumscribe the divine nature can succeed only in fashioning an idol, not in making God known." "He exists in a superessential mode and is known beyond all understanding only in so far as he is utterly unknown and doesn't exist at all." Now, just as Sun Ra once visited planet earth and dwelt in Philly, "there is no culture or religion that has not received and does not express a 'visitation of the Word.'" But in different ways, for as Augustine famously remarked, "That which is called the Christian Religion existed among the ancients and never did not exist, from the beginning of the human race until Christ came in the flesh, at which time the true religion which already existed began to be called Christianity." Ah yes, I get it. Before Abraham was, I AM. Okay. Therefore, for all time, and outside time, "the Superessential gave up his mystery, and manifested himself by assuming humanity." And because He forever assumed humanity, we can stop making asses of you & me. But only if we put in a little effort, for we are not blood relatives, but adopted relativities. Could it really be possible that the One is refractured through the Many? "That God should have clothed himself with our nature is a fact that should not seem strange or extravagant to minds that do not form too paltry an idea of reality. Who, besides a Dawkins or Harris, looking at the universe, would be so feeble-minded as not to believe that God is all in all; that he clothes himself with the universe, and at the same time contains it and dwells in it? If then all is in him and he is in all, why blush for the faith that teaches us that one day God was born in the human coondition, God who still today exists in humanity?" (Gregory of Nyssa). Therefore, the mystery of the Incarnation of the Word contains in itself the whole meaning of the riddles and symbols of Scripture, the whole significance of visible and invisible creatures (Maximus the Confessor). We are the boundary, the final frontier, "like a mediator between creation and the creator" (Clement). For only man, like the creator himsoph, "escapes all definition" and shares the infinite subjectivity of the Infinite Subject; which is why, as Pascal put it, "Man is something infinitely greater than man," and why, upso downso, we are the only creatures "that can fail to become what we already are by nature.... Biological nature develops us only up to a certain point, and then we must individually, with a great deal of deliberation and with full consciousness, seek the rest" (Hanson, in Schuon). Only thereby do we "become greater than the universe into which we were born and which seeks to take possession of us. Thereby we assert or basic freedom" (Clement). Ascent you a son, amen for a child's job! That's the New Man, we're just putting him on. for this manifestivus for the rest of us! *Quotations of the early Fathers taken from The Roots of Christian Mysticism, by Olivier Clement. Is the World a Symballa' Coonfusion? Is reality just reality, or is it a symbol of something else? To make it even more personal, are you just you, or do you symbolize something? Supposedly, practices such as Zen Buddhism help one to cut through all the symbolic fog we gradually accumulate, and which separates us from our essential being. Does it work? Not really. I suppose for a few, but probably no better than having a couple of drinks. I mean, if Buddhism were so great, Buddhist countries would be great places to live, would they not? Hey, are we allowed to criticize other religions, or are only Judaism and Christianity tough enough to take it on the jaw? I'm not suggesting that there is no wisdom in Buddhism, but let's be honest. Where would you rather live, Burma or the United States? America-hating intellectuals -- because they live in America -- have the freedom of hand-selecting this or that isolated element from Buddhism and using it to cast the West in a bad light. But if you consider the overall value system that emerged in Judeo-Christendom, I think you'll agree that it is vastly superior to that which developed anyplace else on earth, unless you're a self-hating leftist troll. This is the problem I'm having so far with Wallace's Hidden Dimensions: The Unification of Physics and Consciousness. I mean, it's an interesting book, and I'm sure he's correct about consciousness being the substrate of the material world rather than vice versa, but he's really got a bug up his asana with regard to the Catholic Church and with "fundamentalist" Christianity in general -- as if Buddhists came up with science and physics! Ironically, he teaches at the University of Santa Barbara, which happens to be one of those cities that was founded by bloodthirsty Catholics. Would he prefer that it be a colony of China? As we have discussed before, true science only developed in one place and in one time in human history, and no place else: in the Christian west. There are well understood reasons why science didn't develop in Buddhist cultures -- for example, the belief that reality is ultimately "empty," or that the phenomenal world is (only) illusory, or that the key to life is to detach from thought rather than pursue it. In general, I find that there is too much of an emphasis on the internal world in Buddhism, which is why it often attracts people in the west that we would call schizoid or narcissistic. The intense focus on their own navel department is conducive to their pre-existing personality style, so they don't really grow with practice, they contract. To a large extent, the same could be said of Hinduism as it historically developed, and from which Buddhism is just an offshoot anyway. However, a close reading of the Upanishads reveals that they do not actually countenance extreme detachment from the world, unless it is in the context of a paradoxical embrace of it: To darkness are they doomed who devote themselves only to life in the world, and to a greater darkness they who devote themselves only to meditation (Isha Upanishad). It's just another way of saying in the world, not of the world. Interestingly, there is a strong parallel between Christianity and Sri Aurobindo's yoga, undoubtedly because he was snatched from India when he was just 7 years of age, and educated at some of the finest schools in England, including Cambridge, at a time when a liberal university education was still steeped in an appreciation of our western spiritual inheritance. Nor, at the time, was there the supposed unbridgeable rift between science and religion that secular intellectuals like to play up today. For example, it is entirely possible that Aurobindo was taught by Alfred North Whitehead, who was a professor at Cambridge during the years Aurobindo was there, and the formidable Whitehead was obviously "on the case" when it came to integrating the most recent findings of science with an expansive metaphysical view that is easily compatible (with modifications) with Christianity (e.g., process theology). For the same reason, Aurobindo was readily able to assimilate science to Vedanta. There is this shopworn cliché among western intellectuals that mankind has undergone three modern "traumas," or assaults to our dignity, from which we've never recovered -- as if the average person walks around crying because of them. First is the discovery of heliocentrism, which displaced the earth from the center to the periphery of the solar system; second was the discovery of natural selection, which meant that man had been here longer than 6,000 years, and descended from other animals; and third, the discovery and elaboration of the unconscious mind by Freud, which displaced man's ego from the center of his own being. Ho hum. Are any Raccoons out there actually trembling over the idea of the big bang, or the genome, or the unconscious? Then you're not a Raccoon. Nor are you a Raccoon if you can't easily accommodate these and other ideas into your spiritual worldview, being that a Raccoon is in love with all forms of truth, which reflect various degrees of beauty in the Divine Mind. The discovery and assimilation of any truth always expands our being, as does love or beauty. Or else it wouldn't be truth. Blatant falsehoods, such the cold waters of leftism or atheism, necessarily cause shrinkage in the being of the testy folks who swim in them. We could just as easily make up a narrative stating that these scientific developments were catastrophic to atheists, since they proved that the universe was created, that genes cannot account for the sudden emergence of our inexplicable humanness, and that the ego's narrow reason is ridiculously insufficient to give an account of reality. We're getting sidetracked. Plus the baby's up. Be back in an hour or so, so we can discover the point of this post, if we ever do. As Aurobindo remarked in a letter, "My own life and yoga have always been, since my coming to India, both this-worldly and other-worldly without any exclusiveness on either side.... I could make no sharp divorce or irreconcilable opposition between what I have called the two ends of existence and all that lies between them.... In my Yoga also I have found myself moved to include both worlds in my purview -- the spiritual and the material -- and to try to establish the Divine Consciousness and the Divine Power in men's hearts and earthly life...." Indeed, this unification of the interior and exterior worlds is what is meant by Integral Yoga, and this integration is certainly the purpose of Christianity as well: the Word became flesh so that the flesh might become Word, thereby spanning all the degrees of existence. In another letter Aurobindo wrote of the Buddha's attitude toward life, that "I do not quite see how 'service to mankind' or any ideal of improvement of the world-existence can have been part of his aim, since to pass out of life into a transcendence was his object. His eightfold path was the means towards that end and not an aim in itself or indeed in any way an aim." Those who don't see Buddhism this way are usually thoroughly westernized minds who interpret Buddhism through an unconscious Judeo-Christian lens that they think they have rejected. It's the same reason why, for the most part, the only tolerant (and tolerable) Muslims are the Christianized ones living in the West. Now, the world is not ultimately real, but it's still real. And the reason why it is real is that it is a projection -- or creation, if you like -- of the Absolute Real. It exists, in the words of Schuon, by virtue of the intrinsic infinitude of the Absolute, which necessarily "projects" into relativity and thereby produces both the world and the metacosmic "space" that we call the great "Raccoon Den" in the sky. If we rummage around that Den -- there, behind the big easy chair -- we see the various degrees of the Divine Essence, which ultimately come down to "Beyond-Being, creative Being, and the Spirit or the existentialating Logos which constitutes the divine Center of the total cosmos." Again, in contrast to the implicit nihilism of Buddhism, "To say, out of a concern for transcendence, that the Absolute is 'beyond good and evil, beauty and ugliness,' can only mean one thing, namely that It is the Good in itself, Beauty in itself; it cannot mean that It is deprived of goodness or beauty." But Bob, you never got around to answering your own question about whether reality is just reality, or a symbol of something else. Hmm. I'm not so sure about that. I'll have to read the post. I had intended to say something about symbolism and metaphor in Sunday's post, before it was hijacked down an unanticipated byway. Symbolism is one of the modalities of the unconscious mind, along with eternity, placelesness, non-contradiction, and conflation of imagination and reality. Humans are so immersed in symbols that it's hard for us to think about them, since doing so will only result in more symbols. Until today. Today I'm going to use my advanced cOOnVision to pry myself free of symbols and find out what's going on underneath them. Freud used the terms "displacement" and "condensation" for the unconscious mind's ability to "identify things with a certain similarity and transfer attributes of one thing to another" (Bomford). If these two properties are extended to their furthest generalization, then it means that anything is identical to the class to which it belongs, and that the class is identical to any of its members. 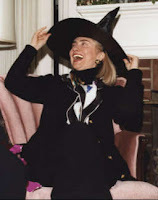 For example, in the unconscious mind, Hillary isn't just like a witch, she is a witch; furthermore, she is both a particular instance of witchhood and the class of all witches. In 2008, the country will essentially decide whether she is a good witch or a bad witch, and whether we will live in a sheliocentric lunar sistem. The conscious use of metaphor (e.g., Hillary is like a witch) invites the reader to "consider a term as one of a set with which it perhaps might not otherwise be classified, and then to draw characteristics from other members of that set" (Bomford). Political advertising, which is to say, MSM reporting, relies heavily upon injecting various metaphors into our discourse, and then letting the unconscious mind take care of the rest. People who see through the ruse are called "conservatives." For example, for certain benighted boomers, you have only to suggest that "Iraq is like Vietnam," and the leftist mind proceeds to do its dirty work under cover of unconscious darkness. Because of symmetrical logic, the mind can draw all sorts of fallacious conclusions, such as "the Vietnam war was bad; war is bad; therefore the Iraq war is bad." The purpose of metaphor "is to both cast up and organize a network of associations." While the conscious mind associates in a linear manner, the unconscious mind associates in what you might call a densely holographic manner. Instead of picturing a chain of linear deductions, imagine a central concept, a sort of spherical object that extends out in all directions at once. Again, archetypal religious metaphors operate in this manner, and are intended to provoke rich associations that link the conscious mind with the upper vertical unconscious mind -- or ego with ground, if you prefer. To the extent that they fail to do this, or are taken too literally (except where they are intended to be), then they cannot do the "work," or verticalestnenics, they were deisigned to. For example, Holy Communion is not just a way to gnaw God. When religious language becomes "saturated," it essentially means that the conscious mind has vanquished the richness of the unconscious mind by reducing its intrinsic polysemy to a single dead metaphor. Paradoxically -- but not really -- if you reduce the One to one, you end up with none. You kill God. This is the way of the inferior man, who imagines that "only what is contingent is real," and "seeks by his method to lower principles to the level of contingencies when he does not deny them purely and simply" (Schuon). For example, let's turn to the first page of Genesis: The earth was without form and void; and darkness was on the face of the deep. And the Spirit of God was hovering over the waters. To say that this is metaphor is not to say that it is "false." For one thing, no mere linear description could ever be sufficient to describe or exhaust the infinite fecundity of the Divine Mind, which is also like a sort of spherical object that extends out in all directions at once. You might say that scripture is scripture because of this very property of provoking rich associations in the manner O-->(n). If it is reduced to mere (k), then it becomes no different than science, with which it cannot compete in that sense. In other words, if you take Genesis as a discussion of the same reality in the same manner as the equations of quantum cosmology, you are very confused. The former is dealing with "vertical genesis," the latter with "horizontal genesis." It's the difference between cosmogenesis and pneumagenesis, bearing in mind, of course, that the eternal activity of pneumagenesis is ontologically prior to that of cosmogenesis. The former takes place outside of time, while the latter takes place within time. "The creation to which it refers did not happen just 'once upon a time' some 13.7 billion years ago, but occurs continuously, in the timeless ground anterior to each moment." "Put it this way: neither the cosmos nor this book have a proper 'beginning,' but both have a center, a center that starts where science ends and must therefore be described in mythological terms. The purpose of myth is to help us re-collect what we have forgotten about our timeless source, our eternal nature, and our ultimate destiny. The metamyth that follows is no different, as it attempts to lift the veil and peer back 'before' creation -- it is a Word from our eternal Sponsor, and should not be evaluated from the standpoint of time." The true theologian, such as Eckhart or Schuon, writes "from O," so to speak, something that Schuon touches on in the preface to his Survey of Metaphysics and Esoterism. Religion, on the one hand, "veils" O -- which no one can see in its unveiled form -- but on the other hand, allows it to shine forth. Thus, seeing the veil is seeing the essence; or seeing the form is seeing the substance. To put it in the form of a laughty paradoxable, religion reveils the hidden God. "Metaphysical Truth is both expressible and inexpressible: inexpressible, it is not however unknowable, for the Intellect opens onto the Divine Order and therefore encompasses all that is; and expressible, it becomes crystallized in formulations which are all they ought to be since they communicate all that is necessary or useful to our mind. Forms are doors to the essences, in thought and in language as well as in all other symbolisms" (Schuon). Jacques Nerson: You wrote in 1968: "Anything is preferable to an honorable career -- exile, or prison, or the monastery." Louis Pauwels: Well, it was poorly said, and was in the absurd climate of '68. At that time, I was emerging from the adventure of Morning of the Magicians, and I admit that I was spoiled. What was clear to me was that I didn't want, that I never wanted, to be a writer with a public "following." I used to say, as I would still say today: Long live freedom, long live the right to change one's direction, theme, writing, research, or position. I was calling an "honorable career" the career of a man who gives what is expected of him. It has always exhausted me to be considered a guide, or more simply a good provider of the usual merchandise (the current rage). Destiny asks something of me, or of someone in me. Even though I don't understand it, it is destiny that I must follow, endlessly escaping from the diverse images of myself which I create. Better exile, prison, or the monastery than submission to what the public expects of me at every step of my passage through this world. But exile and prison have nothing in common with the monastery. I was foolish to put all three of these forms of retreat on the same level. In reality, I have had -- and I pursue -- the life of an intellectual vagabond with mystical tendencies, because I did not have sufficient grace and force to be a true contemplative monk. I had an obscure wish for this kind of life but I didn't know how to see my misery and how to give myself to God in the supremely childlike spirit which pushes man toward the monastery. I had neither enough humility nor this gentle heroism. And this is why I was condemned to wandering. A creative wandering, no doubt... at least I must assume so. What fulfills a life? It is not just the serenity of the stoics. It is what my friend Aldous Huxley called, approximately, the "peace of the depths," or my other friend, Arthur Koestler, "the oceanic feeling of life." Koestler committed suicide. Huxley died in despair. Neither they, who were worth infinitely more than I, nor I, knew how to build from eternity with our earthly presence. But this is what makes a contemplative monk. And finally, this is the only honorable thing to do. In a word: to be in the world but not of it -- action and nonaction embracing. "Like the kingfisher who dives and comes up again without getting his feathers wet." The universal spiritual tradition -- Buddhist, Hindu, or Christian -- deals with these crossings (crosses) between the man in the world and the man behind the man, detached from the world. At one and the same time, here is man: nailed down, yet flying away. Hmm. Where had I read this before? A quick search of my liberary revealed that it was in this collection of essays on Gurdjieff. It is one of the hundreds of books I raced through in the writing of my own book. As I've mentioned before, only after the book was written have I had the luxury of returning to some of the really good books I encountered along the way, and spending a little more timelessness with them. I'd forgotten all about this one, which, if I remember correctly, was -- in keeping with the man himself -- a sort of mixed bag. As are most bags, books, and beings. "I fell headlong into the teaching of Gurdjieff because my most profound impression was -- and still remains -- the absence in me of being. I had and still have this impression that the whole of my thoughts, my feelings, my sensations, my dreams, my ambitions, my acts, my sorrows, my joys -- that this whole is not my real self. Or, if you wish, that there is something else besides that 'me' named Louis Pauwels, and it is that other thing which could give birth to being if I knew how to cultivate it." Well, don't keep us hanging. What else happened to Pauwels in his long strange journey from new age pagan occultism to orthodox Catholicism? Pauwels completed his first novel, Saint Someone, at the age of 25. It is about an ordinary man who is "suddenly transported by the extreme and inhuman unhappiness of finding himself outside himself and outside the world." Interestingly, he states that his dream then was "to depart for the Ashram of Sri Aurobindo" -- a very unusual aspiration, I might add, since very few in the west knew anything about Sri Aurobindo at the time, even Ken Wilber, who in 1945 was negative four years of age and just learning to read. But then Pauwels met a man who told him that he needn't travel to India, because "there is a spiritual master of of uncommon strength" living in France, who can "provide you with the method for living detached and present at the same time, more detached than you ever imagined you could be, and, consequently, more present than ordinary man can ever be." Thus, he became a pupil of Gurdjieff for two years. From his exposure to Gurdjieff, Pauwels concluded that, in order to come closer to the core of his being, it was necessary to become nothing, something that Petey often mentions. What he means in this paradoxical oddvoice is that he felt he needed to "die to myself so that an authentic 'I' [could] be born, to be able to present God a more real presence than that of the 'me' named Louis Pauwels." He eventually concluded that "there was no love in this teaching," and that "the living relationship with others and with God had been left out." But later he changed his mind about this, because the deeper meaning of the teaching was that, in order to establish such a real relationship with God and with others, it was first necessary to establish a relationship with the "more than me which is in me." I see that Pauwels says much the same thing: "It is to this that prayer leads: to the extinction of the illusory fires of existence and the appearance of the crystalline light of the core of being. Then only do we call others into being, with love. Only then do we enter into communication with God, who is the nameless and faceless 'I' of all things in Heaven and on Earth. Only then do we begin to understand what incarnation means." What in carnation?! Congratulations on the equation of your cosmic birth. Oh my stars, He expectorated a mirrorcle, now you're the spittin' image! You haven't perceived the hologram to your private particle? Come in, open His presence, and report for karmic duty. Why, it's a Tree of Life for those whose wood beleaf. So, did exposure to Gurdjieff help or hinder Pauwel's journey to Catholicism? He concludes that it helped, specifically, "to intensify my prayer and to avoid the soft traps of religious sentimentalism." It also helped him to overcome the two existences within, that of the sleeper and the awakened. You might say it helped him become one, and therefore find the One. According to Webster's, metaphor is "a figure of speech in which a word or phrase literally denoting one kind of object or idea is used in the place of another to suggest a likeness or analogy between them." In short, it is figurative language, which is to say, language, for all language is ultimately a "figure of speech," speaking figuratively. How then do I differ from deconstructionists, who also believe that reality is made of language? Fair question. Human beings communicate through symbols, and all symbols are ultimately metaphors. Language as such is nothing but an endlessly interlocking series of metaphors, but where I differ with deconstructionists is in affirming that human language is woven out of the universal Logos that necessarily subtends it. In other words, for the deconstructionist, there truly is no there there, no ultimate ground or referent for language. But I am quite certain there is a there there, which we call the Logos. There is nothing you can say about anything that isn't laden with implicit or explicit metaphors, which is one of the reasons why it is so absurd for the materialist to object to spirituality, since the idea of solid matter is itself a sort of airy metaphor, just a fanciful concept based upon the illusions of our nervous system, illusions like "solidity" or unambiguous "place." Scientists often conflate the abstract and the concrete, and essentially extend the concretions of the nervous system into an abstract worldview. Which is fine, so long as you don't confuse them with metaphysical truth, or with the Ultimate Real. For their part, so-called fundamentalist religionists often do the reverse, which is to say, concretize the abstract. But only God can really do that, since the cosmos itself is none other than a concretion in a small corner of the Divine Mind. As mentioned a couple of days ago, one of the purposes of scripture -- which employs countless metaphors and other seemingly concrete images -- is to follow it back upstream to its hidden source, the "place" from which revelation perpetually flows like a spring from the ground. Indeed, the place from which language itself flows. It's not that scientists don't use metaphor in most every statement they make about reality, just that the metaphor has generally become dead, or saturated in Bion's terminology. Often, advances in science cannot be made until a new metaphor is employed. For example, the so-called Newtonian worldview regarded the universe as a giant clock. Seeing it as such is definitely useful, and applying it to our experience discloses a range of additional "facts" to ponder. But eventually, facts are inevitably disclosed that don't fit the old metaphor. That happened with the development of quantum and relativity theories, way back in the 20th century. There is simply no way to understand the quantum world with the clock metaphor. Rather, it is much more like an ocean, a roiling cauldron of ceaselessly flowing energy that tosses up exterior forms the same way the sea waves upon the shore. Or better yet, perhaps it's like the infinitely complex global weather system. We see things like distinct clouds, but we cannot see (with our eyes) that the cloud is simply an outwardly visible product of an inconceivably complex global weather system. Only Al Gore thinks he can see the latter, but of course his head is up his assumptions.... As Michael Crichton has written, Gore's linear paradigm is so last millennium. I don't know if I want to get sidetracked here.... then again, maybe I do.... Whatever.... I'm just free associating anyway, following language where it leads.... but this is one of the things Joyce was up to in Finnegans Wake, which is a veritable sea of metaphor constructed out of dozens of languages. It is as if the usual solidity of language has "melted" and we are left with only the quantum realm, so to speak, from which it emerges. Throughout the book, various intrinsic complementarities clothe themselves in time and space with the dream logic of night. Just like the thing we call "history." You might say that Joyce shows us the complementarity between the different forms of logic in history and herstory, if you know what I meme. In fact, one of the central philosophical ideas to emerge from quantum theory is that of complementarity. That is, we can never affirm one thing about the cosmos without "para-doxically" (which literally means "beyond speech") affirming its complementary opposite. Therefore, is the world made of particles? Yes. Is it made of waves? Yes. But these are opposites. Of course. Well, not really. They are complementary, co-arising simultaneously. Incidentally, one might be tempted to think that Democrat/Republican (or liberalism/leftism) represents a true complementarity, but it doesn't. The true complementarity is within conservatism itself (as always, I am speaking of the classical liberalism of our founders, the closest we have to a "perfect" political philosophy). Among others, it embodies the dynamic complementarity between liberty and order, and permanence and change. Leftism is not complementary to liberalism, any more than disease is complementary to health. Leftism is stultifyingly monolithic and denies many of the most important human complementarities that drive change and progress; for example, the complementarities between male and female, child and adult, sacred and profane, equality and liberty. Nor are freedom and property complementary, the former being rooted in the latter; which in turn is rooted in the 2nd Amendment, which is to say, "don't steal my stuff or I might just shoot you, because if you steal property you are stealing liberty, and therefore human life and dignity itself."